Anchor are the largest not-for-profit provider in providing housing, care and support to people over 55 years old. They are passionate about taking care of people over 55 and want to make sure they provide them with great places to live. 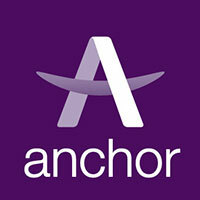 With over 50 years experience Anchor continue to do what they do best to make a difference. Anchor Apprenticeships are a great career route if you're eager to start work whilst also continuing your learning. Anchor Apprenticeships combine academic study with on the job training enabling you to gain a range of skills, experience and a credible qualification all whilst getting paid!